InstaLifestyle - Vegans, Fashion, Fitness oh my! Loni & Andy are both busy mothers that somehow have the time to prepare elaborate vegan meals to further the health of their adorable children. They have professional websites linked in their bios as well as Ebooks & Recipes available for purchase. An interesting idea to begin with - mothers posting recipes on social media and selling them to make a living (a pretty good living too). But how did this happen? 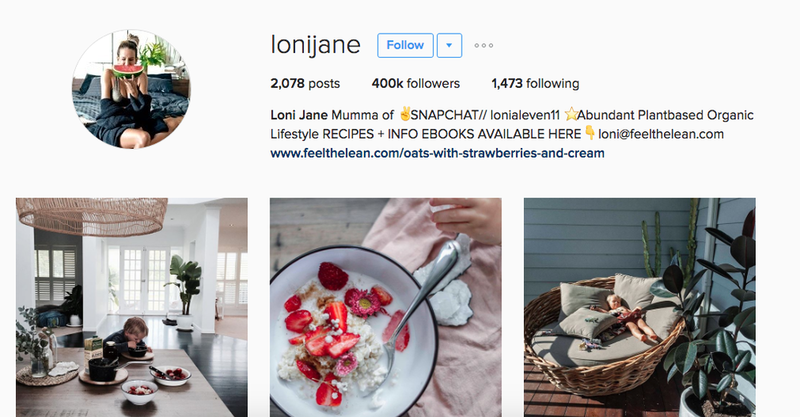 With a combined close to 1 million followers these women are icons in the vegan community. High quality photographs and cute children aside, are women THAT interested in being vegan? I tend to disagree. Women on social media are close to being obsessed with radical lifestyles - whatever they may be. The lavish Kardashians, fit Kayla Itsines, fashionable Chiara Ferragni, the adventurous @followmeto & the healthy vegan mothers - a very strange bunch if you ask me. It’s the social media moguls that every woman with a social pulse follows on Instagram and Snapchat. These social influencers are showing the extreme end of the spectrum for how to live your life. Throw the idea of balance out the window because it’s either go hard or go home. By showing women that the extremes are the new normal, social media influencers are warping and changing the ideas and values of their followers - good or bad. Eating kale with every meal is not normal and neither is changing your outfit to match the scenery of an Italian Villa. A lifestyle balance is what is important to remember when falling into an Instagram hole for 3 hours on end - finding that one influencer that changes your mentality and point of view. Remember to balance your life based on what you love and not to compare yourself to the extreme. Instagram is only a portal of controlled reality, it truly is what they want you to see.